EDIT: My joke has failed, thanks a lot new page. While the game itself is mechanically nothing special, the changes it has made to my community and the world at large is beautiful. My life has become so much more of a joy since this game came out, and it's not the game itself, it's the meta bringing us together. Use either of these fancy images in your avatar or signature and support whatever team you like. This game is pretty cool. I caved and spent $10 for backpack space but I don't even care, the kind of fun I've had with this is unparalleled in today's landscape. GoldenGhost thinks he's cool and decides to play Go for 20 hours or so to brag about how great Valor is, when the clearly superior Mystic is "trash". Damn you guys in the US are wayyy ahead of me. Between work and server issues, I can't play this game all that much. Although today I had to go into another town for work and, even though the game hasn't released here yet, I saw like 4 people playing Pokemon Go; 2 nerdy guys and a couple of kids...it doesn't sound like much, but it's more video-games than I've seen in public in a long time. Also I just reached lvl5. Team Valo(u)r ftw! I just saw this meme on r/PokemonGo. 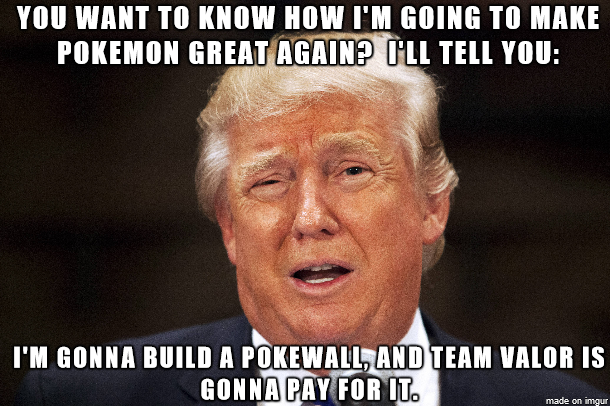 Best Pokémon Go related meme since the game released. So am I just the only person on Instinct in the world? The more important question here is where in the world can I find one of those OP Snorlax? I NEED one. Apparently it uses .01 GB per hour, so that's 100mb. You might be okay to play for a bit, but I hear it drains your battery very quickly. TFW you are on Team Instinct with no one else on your team. I went out with my mom and played it today. My battery drained after approximately 3-4 hours. My phone is a Samsung Galaxy Note 5, so I can't speak to those who have newer or older phones than mine and I especially cannot speak for iOS. I'm sure newer phones don't drain as fast, but it also depends on battery capacity. This new phone i'm looking at has low battery, but lots of performance. So it might handle the game better. I just wish I could play it! My phone handles the game pretty poorly. I'm not sure if it's the app or my phone (since most other 3D mobile games work fine on it), but I get a lot of lag while playing sometimes and the app crashes fairly often. However my phones battery capacity is great and PokemonGo doesn't really impact it at all (I have a MotoG2). I think I prefer it this way since I use my phone a lot on my way to/on my way back from work. I'd rather have the game be a little unstable but still have battery life left for music & internet than the other way around.